For two years, Rett University has worked behind the scenes to recruit and prepare professionals committed to doing more for students with Rett Syndrome. During this time, Susan Norwell has mentored coaches to build a network of resources that families, educators and therapists can connect with for support and guidance in helping students with Rett Syndrome build communication, language and literacy skills. 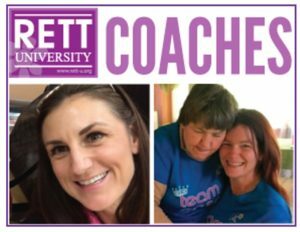 Rett U Coaches will be available for one-to-one consults, IEP goal development and eye-gaze device programming. They will also be working with schools and development centers to provide the foundation and context many need when working with students with Rett Syndrome. *Please note our coaches work on an hourly rate which they will discuss with you after connecting.